Are you a BBB, CCC, DDD, FFF, GGG, LLL, MMM, or PPP kind of girl? As if millennial terms (ex. TBH, SMH, AF) aren’t enough to shake up the English language, we have a growing number of acronyms just for beauty and makeup junkies. Have you ever found yourself lost in translation in the middle of a beauty thread or while online shopping? We’ll break it down for you, CGs. AHA: Alpha Hydroxy Acid, derived from natural ingredients like milk and fruit sugars. AHAs are commonly used in chemical peels, anti-wrinkle creams, and sun damage treatments. BB: Beauty Blender, that egg-shaped and usually pink sponge used for applying foundation and other makeup. When written as “BB cream,” BB refers to beauty balm or blemish balm cream, the Korean makeup craze that started years ago. It’s a mix of moisturizer, foundation, SPF, blemish cream, and other ingredients. BHA: Beta Hydroxy Acid, another name for salicylic acid, an ingredient that refines pores and exfoliates skin. BOGO: buy one, get one. Alternative: BOGOF (buy one, get one free). BS: beauty shop. Alternative: BSS (beauty supply store). CC: When written as “CC cream,” CC refers to color-correcting or color control cream, the successor of the BB cream. When used alone, CC may refer to closed comedones or when online shopping, credit card. DC: discontinued. When online shopping and you see “DC” under the product photo, then it’s been phased out. Alternative: DC’ED. DD: When written as “DD cream,” DD refers to double duty or dynamic do-all cream, another successor of the BB cream. DR: derma rolling, a micro needling procedure that uses a hand-held rolling device. It gently presses tiny needles against the skin to create tiny punctures that promote self-healing and rejuvenation. EE: When written as “EE cream,” EE refers to even effect or extra exfoliating cream, yet another successor of the BB cream. EOTD: eye of the day or eye makeup of the day. Alternative: EOTN (eye of the night). HD: high definition or heavy duty, depending on how you use the acronym. Alternative: HDB (heavy-duty beauty). HG: Holy Grail. Also known as HGP (holy grail product), this refers to a beauty product that is number one in that person’s particular category. IPL: intense pulsed light, a non-invasive technology used by cosmetic and medical practitioners to perform aesthetic procedures, such as hair removal and varicose vein treatment. LOTW: look of the week. May apply to makeup or fashion. MLBB: my lips, but better. 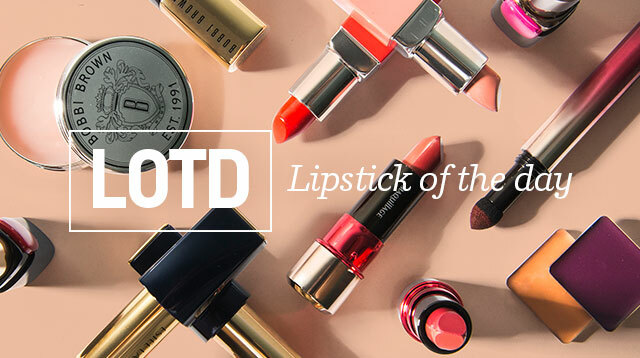 Refers to a shade of lipstick that enhances the natural color of your lips. Alternatives: YLBB (your lips, but better) and YLBW (your lips, but worse). MOTD: makeup of the day. Just like OOTD (outfit of the day), MOTD refers to the makeup you worked hard on—from on-fleek eyebrows to contoured cheeks—and plan to wear the whole day. Alternative: FOTD (face of the day or find of the day) and FOTN (face of the night). SIB: still in box. Other forms: NIB (new in box), LNIB (like new in box), BNIB (brand new in box), BNNB (brand new, no box), BNWB (brand new with box), and BIN (buy it now). SPF: sun protection factor. When placed on a product label, this is often followed by a number. The higher the number, the higher the protection from the sun. SWAG: stuff we all get, a.k.a. the loot bag or freebies you get after attending a press con, fashion show, product launch, or PR event. Source: Beauty Term, LLC, XO Vain, Makeup Stash.